Happy Birthday to How Sweet The Sound on Saturday. 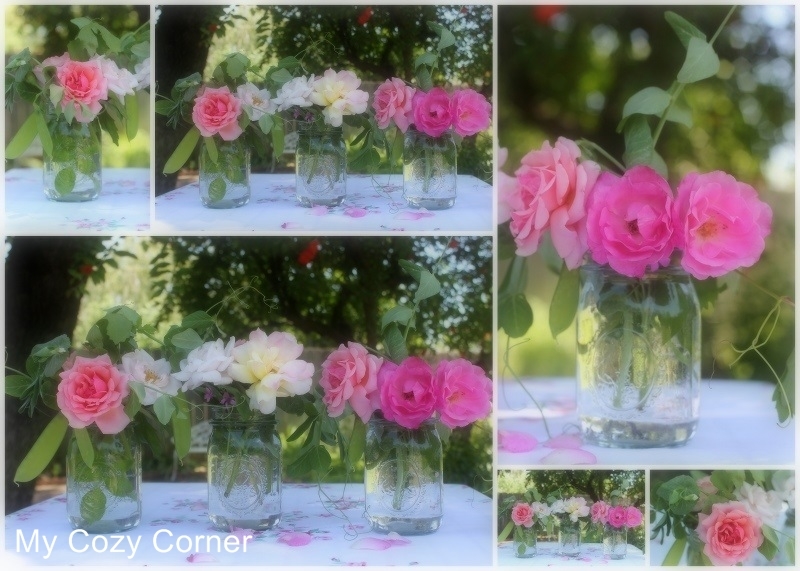 I have a few new roses blooming and I found three light blue pint jars in my canning cupboard to use a vases. The snow peas are growing in the big garden and every evening when I take my walk to check on things, I pick a few pea pods then stand in front of the climbing vines eating the fresh snow peas. They are my little treat. Can you see the pea pods? I have two new roses. Garden Party and Secret. Secret and a pea blossom and pea pods. A pea pod blossom yum! Have you ever eaten Pea Shoots and Tendrils? Some olive oil, Garlic clove, cut in half, A sprinkle of sea salt, Chili flakes, if you like heat. Rinse and chop the pea tendrils. Rough chop so you can see the little curlies in the final dish. In a skillet heat a little bit of olive oil and the garlic halves until the aroma and essence of the garlic is released; remove the garlic clove from the pan and save for later if you'd like. Add the chopped tendrils and saute until they cook slightly, how long will be up to you. Ideally you would want them barely wilted and still flavorful and crunchy! Serve with a tiny sprinkle of sea salt and maybe chili flakes if you want a little bit of heat. Soft and beautiful with a little bit of flavor. My prayers are with the families in the Midwest dealing with a catastrophic event. 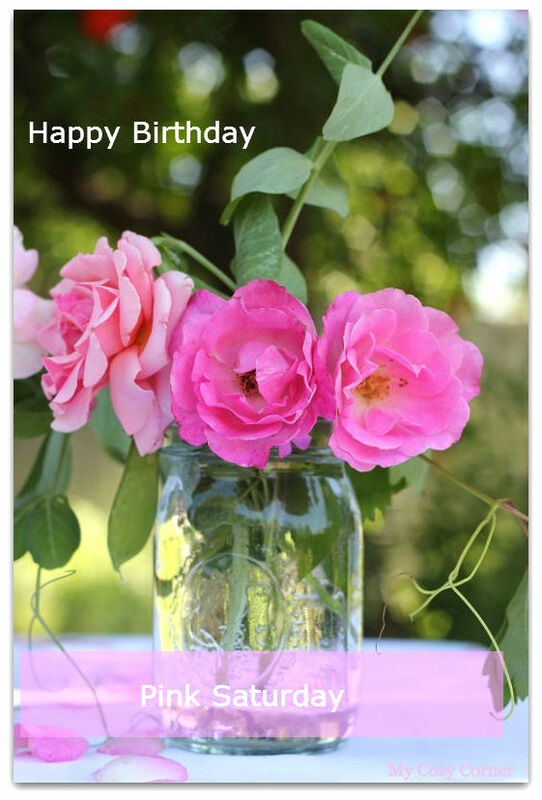 Your roses are TO DIE FOR gorgeous - and perfect timing for Bev's Pink Saturday birthday special! I wish my roses were more and nicer, I am new to being a rose momma, and not quite sure I am doing it right. I adore yours. And I think I need a rose called Tea party, how sweet is that? How Beautiful! I absolutely LOVE your roses. Can't wait for mine to start blooming; should be in the next week or two. . .thanks for the lovely images which I am so enjoying. I can ALMOST smell them. . .mmmmm. Roses and more roses! Aren't we so blessed God has created these beautiful number?! Thank you for sharing them Betty. Hope you have a happy weekend. I hope I could join your pink Saturday soon. You have some very pretty flowers. I like the idea of putting them in jars. Looks very nice. Such gorgeous roses! I love flowers in jars! They are romantic, elegant and truly cottage! Oh my, these are simply perfect for Beverly. What a lovely post for this happy occasion. Your roses are simply scrumptious! I can alost smell their scent through the computer. Beautiful post and Happy Pink Saturday! Have a beautiful Memorial Day weekend. Oh, my! This is definitely the spot to stop and smell the roses. Thanks! Thank you for being a part of Seasonal Sundays. Gorgeous roses! Love this post. I grow roses and love to photograph them. Your photos are stunning, and you know I adore roses. Garden Party is my favorite. We have eight in a bed along our driveway. Happy Pink Saturday. I am so glad you are here to celebrate with us. Thank you for all you do to make Pink Saturday special.